Enveloped, spherical, 80-100 nm in diameter. Monopartite, linear, dimeric, ssRNA(+) genome of about 11.7-12.8 kb, with a 5'-cap and a 3’poly-A tail. There are two long terminal repeats (LTRs) of about 500-650 nt long at the 5' and 3' ends. The LTRs contain the U3, R, and U5 regions. There are also a primer binding site (PBS) at the 5’end and a polypurine tract (PPT) at the 3’end. The integrated provirus utilizes the promoter elements in the 5' LTR to drive transcription. This gives rise to the unspliced full length mRNA that will serve as genomic RNA to be packaged into virions or used as a template for translation of gag(pro) and gag(pro)-pol (1 ribosomal frameshift) polyproteins. The spliced mRNA encodes env that is cleaved into SU and TM envelope proteins. 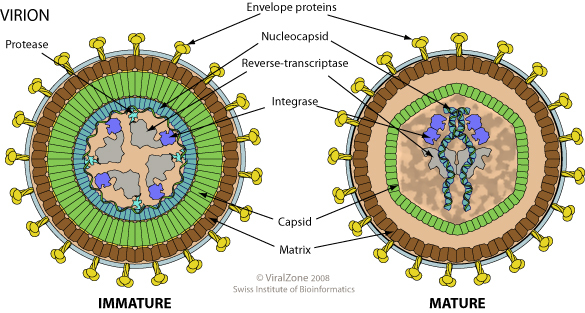 Virus attaches to host receptors through the SU glycoprotein. TM glycoprotein mediates fusion with cell membrane. ssRNA(+) genome is copied into a linear dsDNA molecule by the reverse transcriptase. Nuclear entry of the viral dsDNA when the nuclear membrane is disassembled at mitosis. Viral dsDNA is covalently and randomly integrated into the cell’s genome by the viral integrase (=provirus). Transcription of provirus by Pol II produces viral spliced and unspliced RNAs. Nuclear export of the incompletely spliced RNAs. Translation of unspliced viral RNAs produces Env, Gag and Gag-Pol polyproteins. Assembly of the virion at the host cellular membrane and packaging of the viral RNA genome. Budding through the plasma membrane and release of the virions. Proteolytic processing of the precursors polyproteins by viral protease and maturation of the virions.